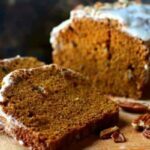 Rich and spicy pumpkin bread with a sweet bourbon glaze - this loaf is perfect for holiday giving AND year round eating! You can substitute 1 teaspoon of vanilla for the bourbon if you like. Just add enough extra liquid (water, cream, milk) to make up the difference. 1 tablespoons to 2 bourbon or enough to make a thick glaze. Add the cooking oil, brown sugar, and sugar to the bowl of a stand mixer. Beat on medium until well mixed and the sugar starts to dissolve. Add the eggs, water, and bourbon. Beat on medium until very smooth. Stir the dry ingredients into the wet ingredients quickly, just until blended. Spoon into the prepared loaf pans and bak for 1 hour 10 minutes, or until a toothpick inserted in center comes out clean. Mix the bourbon and the confectioner's sugar until smooth, adding the bourbon a little at a time. this was made in 8-1/2 x 4-1/2 sized loaf pans.